Grocery shopping and meal planning has its challenges when working on a tight budget. It even gets trickier when you are operating on a tight budget and still dedicated to healthy eating. Below you will find the top 5 tips for enjoying healthy meals on a budget. Buying produce at the local farmer’s market is always a cheaper alternative compared to buying in the local supermarket. The produce sold in a supermarket might be organic, but the fact remains that the supermarket still has to make a profit. This means that goods sold there will always be expensive. However, buying at the local farmer’s market means that it is possible to negotiate with farmers directly, thereby getting fresh produce at a great price. It is possible to grow herbs and vegetables in a small kitchen garden to provide a steady supply of fresh produce for preparing healthy meals throughout the year. If you live in a small apartment or home, wonderful books like Square Foot Gardening by Mel Bartholomew allow you to take advantage of each and every inch of available gardening space you have. Garbanzo beans, lentils, and black beans are extremely versatile and incredibly healthy. And, when purchased as dry goods they can be cost effective. You can definitely stock up on these items as they are the cheapest items for preparing healthy meals. Excellent providers of protein, calcium, fiber, folic acid, potassium, and healthy antioxidants, dried beans can last for over a year past their printed expiration date if stored in a cool, dark pantry. Buying from a dry goods grocery store is a great way to stretch one’s budget even further. It is important to create a meal plan before shopping for healthy and budget-conscious food items. If you have a specific idea of what you plan to cook for the week, it is important to have a shopping list with you when you go grocery shopping. Stick with the meal plan, buy what’s on the list, and you’ll be sure to stay on track with the healthy eating plan and not spend more than you intended. In addition to planning your meals, it is equally important to keep a journal of food eaten. The journal is a great way to monitor food intake, improve your diet, and stick with healthy food choices for the long-term. And, finally, it is always cheaper to cook at home than to eat out. As a rule, eating out should be limited to just once a week, or perhaps, once or twice a month. The great thing about this approach is that it becomes something to look forward to and becomes a treat. Meal planning is also a great way to avoid getting bored with food. With the meal plan, there will always be something to eat to reduce the urge to eat out. Eating healthy all the time can be difficult in the beginning, but it is still worth it in the end. 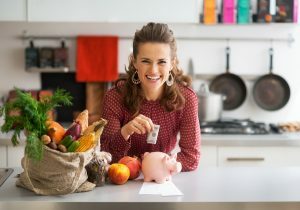 The 5 tips for enjoying healthy meals on a budget are guaranteed to help people live healthier for longer. It does not have to cost a fortune as clearly shown here. Most healthy food options are actually quite affordable.